In a big win the New Norfolk Eagles have won their third strait premiership and the fifth in six years. After quarter time the Eagles totally outclassed the Magpies, running out winners by a massive 84 points. Full-forward Josh Hall finished with eight goals. A big night ahead at the clubrooms! 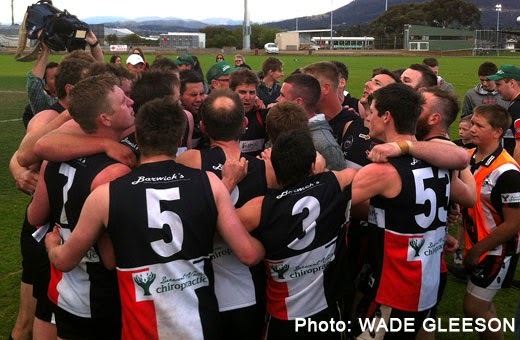 The Eagles celebrate their senior premiership win! After being 14 points up at half-time, the Eagles put the foot to the pedal and piled on 12 goals while Claremont failed to score. In an outstanding brand of football, the Eagles showed what a team they really are. Nathan Ross kicked three goals for the quarter and took a screamer to go with them as the Eagles stretched their lead to an astonishing 88 points at three-quarter time. I have never seen a lead be extended to such an extent after being down by 20 points at quarter time. Josh Hall has six goals so far. WITH the Eagles 20 points down and the crowd at a hush leading into the second quarter, the Eagles lifted their game from the first bounce with better teamwork and accountability, which is the style of football they wre known for throughout the season. At half-time instead of being 20 points down New Norfolk has kicked seven goals and find themselves 14 points up. In a tight tussle early in the first quarter, underdogs Claremont kicked away and outscored the more fancied Eagles. The Magpies' running play is a real concern for New Norfolk leading into the second quarter.